Nationale is excited to host a special friends & family event in celebration of Jon Raymond's new novel FREEBIRD (Graywolf Press). Join us on Tuesday, March 7 (7 p.m.) for a conversation between Jon and fellow Portland writer, Peter Rock at Nationale. Jon Raymond is the author of Rain Dragon and The Half-Life, a Publishers Weekly Best Book of 2004, and the short-story collection Livability, a Barnes and Noble Discover Great New Writers selection and winner of the Oregon Book Award. He is also the screenwriter of the film Meek's Cutoff and co-writer of the films Old Joy and Wendy and Lucy, both based on his short fiction, and the film Night Moves. He cowrote the HBO miniseries Mildred Pierce, winner of five Emmy Awards. Raymond's writing has appeared in Tin House, the Village Voice, Bookforum, Artforum, and other publications. He lives in Portland, OR. Peter Rock has published eight works of fiction, most recently Klickitat. He lives in Portland, OR with his wife and two fierce young daughters, and teaches writing at Reed College. His novel-within-photographs, Spells, will be published by Counterpoint in April. The adaptation of his novel My Abandonment, directed by Debra Granik, will begin filming in Portland this Spring. With more than 30 contributing artists, "Text means Tissue" is the accompanying publication to Francesca Capone's solo exhibition, currently on view at Nationale. Please join us at Nationale this Sunday, February 26 (3–5p.m.) for the release & reading. Come help us celebrate this extraordinary project and see the show one more time! Readings by: Francesca Capone, Patricia No, Anahita Jamali Rad, Alayna Rasile Digrindakis, Catie Hannigan, and Molly Schaeffer. Thank you to all the contributors: Alexandra Barlow, Anna-Sophie Berger, Jen Bervin, Amaranth Borsuk, Tess Brown-Lavoie, Charity Coleman, Corina Copp, Elizabeth Crawford, Alayna Rasile Digrindakis, Ricki Dwyer, Catie Hannigan, Marwa Helal, Emily Hunt, Lucy Ives, Rin Johnson, Mariette Lamson, Sophia Le Fraga, Monica McClure, Helen Mirra, Katy Mongeau, Kristen Mueller, Vi Khi Nao, Patricia No, Antonia Pinter, Anahita Jamali Rad, Emmalea Russo, Molly Schaeffer, Martha Tuttle, Rachel Valinsky, Cecilia Vicuña, Rosmarie Waldrop, Tali Weinberg, and Laura A. Warman. Writer Paul Maziar's recent review of Jaik Faulk's November show at Nationale is a welcome return to Jaik's meditative still lifes. Read the full review HERE. AMY BERNSTEIN / LAST DAYS! We encourage you to turn the TV off today and visit art galleries, museums, libraries, and bookstores at a time when culture & education are so important. Nationale will be open regular hours from noon to 6pm on Friday. On Saturday the gallery will be closed so we can attend and support the Women's March. Many thanks to Megan Burbank, at The Portland Mercury, for her inspiring article, THE ARTISTS RESIST about how art can help us through these bleak political times (as it has so many times before!). Burbank writes, "...if you’re looking for an aesthetic refuge from the 24-hour news cycle, pop in to see the shop’s January show of Amy Bernstein’s minimalist paintings. 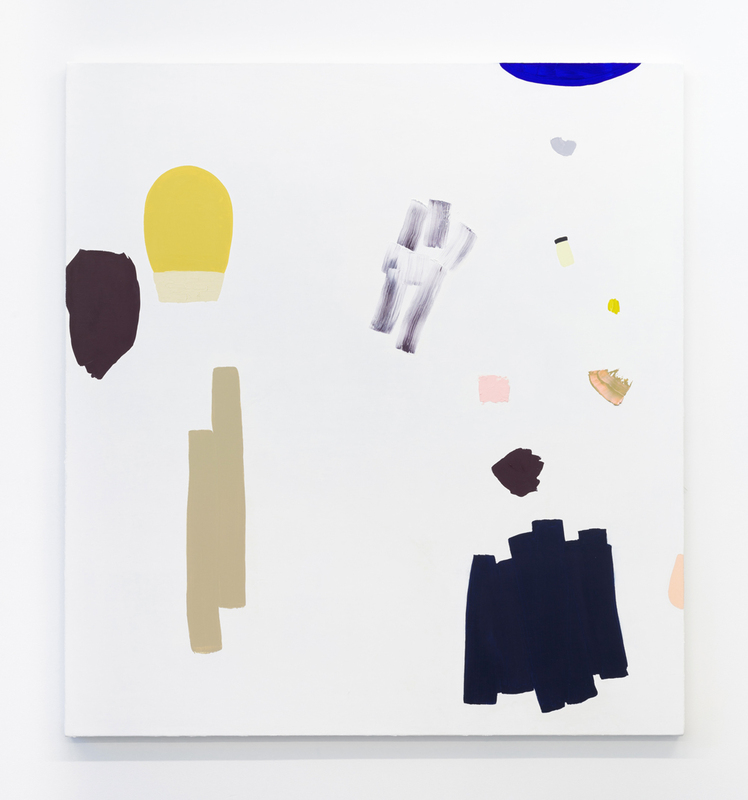 A Lover’s Race features neatly elegant constructions—bright blobs of color on white canvases that seem to blend into the wall—and after months of trying to make sense of Trump tweets, it’s a relief to get away from screens and in front of abstract pieces. Nationale’s accompanying copy calls the show an attempt to reach the 'heart within the chaos,' which is exactly what it was for me on a recent weekday visit." Check out the article for other great exhibitions and programming happening now to, as Burbank puts it, "preserve your sanity"! Short talk by Fredrik Averin at 3:30 p.m. Calling all book lovers! Nationale is excited to kick off 2017 with a book event featuring bookmaker/designer/collector Fredrik Averin, and writer/maker/publisher Delphine Bedient. Join us for an informative afternoon, which will include a short talk from Averin about his extensive vintage book collection, browse the books made by these two innovative local artists, and help us celebrate Bedient’s most recent book, Every Single Piece of Blue Clothing That I Currently Own. Nationale will also be highlighting one of our most beloved publishers, Haymarket Books, who brought us Rebecca Solnit’s Men Explain Things to Me (our bestseller) and more recently, Angela Davis’ Freedom Is a Constant Struggle, to name just a few. The Need for Books marks the first in a series of events highlighting our library and the work of inspiring bookmakers. Born in Stockholm, Sweden, Fredrik Averin received his MFA from Konstfack – University College of Arts, Crafts, and Design in 1998. His work is included in the following libraries: University of Oregon, University of Washington, University of Buffalo, Columbia University, Stanford University, SFMOMA, and MACBA: Museu d’Art Contemporani de Barcelona, and in Portland, OR, at Division Leap, Passages Bookshop, and Nationale. Averin currently lives and works in Portland, OR. Delphine Bedient is a writer and maker currently based in Portland, OR. She writes fiction and also runs Sincerely Analog Press, which publishes conceptually-minded books focusing on the contemporary ephemera and marginalia of human existence. Her writing has been published by Blunderbuss Magazine and Fog Machine, and a collection of her short fiction, entitled Down and Out on a Yacht, is available from Two Plum Press. She spends most of her time touching books. Thrilled to see artist & writer, Francesca Capone featured on The Creators Project. So looking forward to her upcoming February solo show at Nationale, Text means Tissue! Nationale gets a nice mention in The Oregonian about untraditional art spaces in Portland. Read more HERE. As much as Nationale has always tried to play the retail game when it comes to Black Friday, we're not in the mood this year for business as usual. Actually we are outraged by what is happening at Standing Rock and have a hard time focusing on running a business when there seems to be so many more important ways we could use our time and energy right now.